At what point do we stop calling Theresa May’s approach aid and start calling it profiteering under a different guise? The next time a British PM pays us a visit, we should demand a more frank conversation about the real role played by private British interests in South Africa. Perhaps we should ask them to pay back the money too. Last week Theresa May visited South Africa, Nigeria and Kenya, kicking off her stay in South Africa with a speech in Cape Town on the new strategy for UK aid. 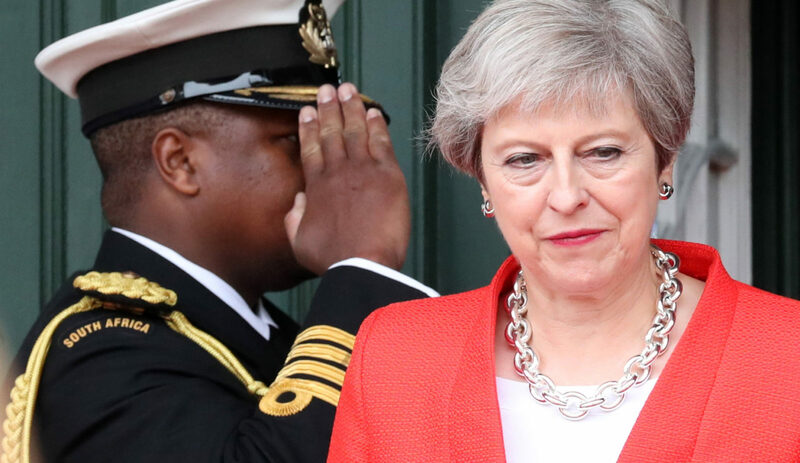 For the UK, it was a significant announcement that May will maintain the aid commitment at 0.7% of Gross National Income but will repurpose it towards British (corporate) interests, aligning it with May’s free-market ideology. While many have welcomed Britain’s apparent re-engagement with South Africa on these terms, May’s message should be met with scepticism. The proposed shift towards British private sector interests is not the panacea she promises it to be. May was blunt: “I am unashamed about the need to ensure that our aid programme works for the UK”. In her own words, she is “a Prime Minister who believes both in free markets and in nations and businesses acting in line with well-established rules and principles of conduct”. Except that as South Africans we are uniquely placed to know that this is not true. As a country that has been rocked by a seemingly never-ending series of corporate corruption scandals (many of which have their headquarters in London) – it is a small marvel that the primary ridicule to come of May’s visit has been aimed at her dance moves. South Africans should scoff at May’s claim that British business is uniquely ethical and committed to anti-corruption. We have not forgotten the role of British PR firm Bell Pottinger in waging a hate-based propaganda campaign in support of the Gupta network as it sought to fight off accountability for looting South Africa’s state-owned enterprises. Nor have we forgotten the multiple serious allegations that British arms company BAE paid bribes during the 1999 Arms Deal, corruption that has had catastrophic consequences for South Africa’s democracy ever since. Either May doesn’t know what British companies get up to outside of Britain, or she does but thinks that we don’t. It’s not clear which interpretation is worse. What is clear from May’s address is that from now on UK aid is going to be used to stem migration of Africans to the UK, while opening up African markets for British companies to export to and British investors to reap profits from. A number of commentators have already highlighted that this approach is nothing new at all. British aid already does cater to British interests. The UK doesn’t support countries most in need, it supports countries of most use to Britain. And only with the the portion of its aid budget which even makes it out of the UK. Despite the UK’s commitments to ensure that aid is spent tackling poverty rather than generating business for UK firms – the amount of UK aid spent on private contractors has surged in recent years, from £540m in 2010/11 to £1.34bn in 2015/16. Adam Smith International, a for-profit London-based consultancy and historically a major beneficiary of UK aid paid it’s directors six-figure salaries and made an after-tax profit of £14m in 2014. May’s announcement comes at a time when conservative forces in the US, UK and elsewhere have all been pushing back against aid spending. The conservative, neoliberal narrative is that African governments are corrupt, aid is inefficient and ineffective and developed nations should be putting their own countries first, providing local jobs while preventing in-migration. May’s administration is one of many which believes that the private sector has the answer to all of these problems. The shift towards private sector involvement in development is a growing international trend among donors- whether public, philanthropic or multilaterals like the United Nations. It is a narrative based on the belief that public and donor funding isn’t enough to address development challenges, and that we must leverage the private sector to provide public goods more efficiently. Its a narrative that too often paints public-private partnerships as unquestionably win-win and the pursuit of profit and social development as always compatible. The narrative also minimises the importance of aid in the poorest countries. According to a recent study by the Institute for Security Studies, “without aid, government revenues in Africa’s 27 low-income countries would be 10% of GDP instead of 21%. This is a huge difference that adds to the capacity of poorly resourced governments to provide basic services.” For many countries who receive development aid, their need or dependency stems from colonialism based on extractive industries often by and for corporations. In South Africa and elsewhere, European powers including Britain waged wars to secure access to natural resources so that their corporations would profit. A historical example is the London Rhodesian Mining and Land Company (Lonrho), a British colonial construction which started in 1909 in Rhodesia and spread through the continent, eventually securing mineral rights in South Africa, perhaps due in part to their leader’s (Tiny Rowland) assistance to the apartheid regime. The shadow of this history remains influential today. Lonrho would become Lonmin, the mining company whose striking workers were murdered by police at Marikana for demanding fairer wages. In the absence of formal reparations for centuries of theft, aid isn’t charitable, it is a minuscule component of what colonising countries owe to the nations they plundered. Repurposing it once again towards extractive industries based in the Global North which profit more than recipients of aid is shameful. Extractive industries are no longer just the Lonrhos of the world, but the KPMGs, the McKinseys and the Steinhoffs too. Poverty reduction or wealth extraction? In the last year, 238 cities around the world competed to be the most “attractive” location for Amazon’s second headquarters– offering tax breaks worth up to $7-billion. Competition between states and cities to be the most open to investment and most attractive to the private sector is ultimately a race to the bottom that benefits no one – except the top 1%. At best, it is a narrative which frames states and cities as beggars and not choosers of the international investment they receive. At worst, it is a narrative in which any investment is good investment and investment is synonymous with growth, which is synonymous with development. Investment that reinvests profits locally and pays its fair share in tax can have a positive impact locally. Yet the UK is a key player in a global financial system which facilitates exactly the opposite. While in Cape Town, May was happy to boast that London is an “unrivalled global hub for international investment, with more than £8-trillion of assets under management” and claim that the United Kingdom’s “legal system is second to none, including some of the toughest anti-corruption laws in the world”. It would be more appropriate to describe London as a global hub for illicit finance, and a key facilitator in the movement of money out of developing countries. In a recent study that analysed 98-million corporate entities and their offshore structures, the United Kingdom was named as the second most prominent conduit for capital to be moved by multinational corporations into “sinks” – zero tax jurisdictions where capital can be stored to avoid or evade tax responsibility. The UK and its London-based financiers specialise in facilitating the movement of capital to a set of these “sinks” – specifically Bermuda and the British Virgin Islands, British Overseas Territories that are both in the top five “sinks” in the world. In this context, perhaps regulating the private sector has a better return on public funds than mobilising it? Large corporations use complex offshore structuring and the movement of capital in these ways to avoid accountability and to minimise payment of tax, thereby ensuring that they can extract maximum profits while minimising their contribution to host countries. As a central player in this system, the United Kingdom has shown little interest in securing greater benefits for poor countries from the corporations that operate there, prioritising the interests of the latter instead. Despite May’s claims to the contrary, the UK’s financial regulators and prosecutors have failed to prosecute those in the private sector when their conduct has been unlawful. There has not been a single prosecution of a bank or company on money laundering charges. Further, the “big four” auditing firms have become increasingly complicit in the illicit activity they are supposed to prevent. KPMG’s conduct in South Africa is merely symptomatic of broader failures in the sector. They write in their personal capacities.